The Winnipeg Transit Riders’ Association is open to everyone. Please Join Us! and bring your ideas and ability to the next meeting. 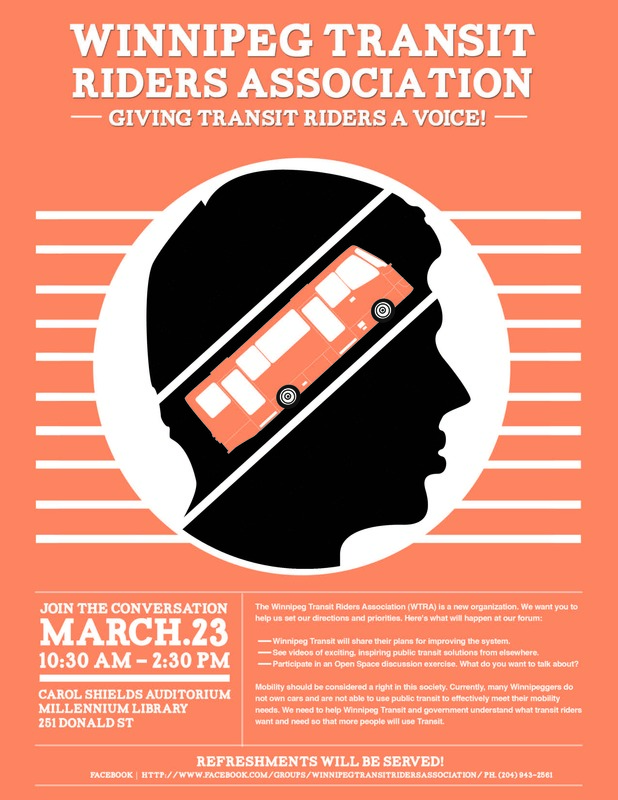 The Winnipeg Transit Riders’ Association will be joining the Amalgamated Transit Union, The Canadian Federation of Students and others who want to put Public Transit on the Election agenda at a rally: October 17, 11:00am, City Hall. April 9, 2014 – Some members of Winnipeg City Council are hesitant about supporting rapid transit. The Transit Riders Coalition supports the proposed rapid transit route provided that all land north from the proposed Hurst – Beaumont road extension to the CN rail line is protected. The City needs to buy this land and preserve it as parkland. This article has links to two petitions for and against rapid transit. The City’s 2014 operating and capital budgets are moving through Council. There is some additional money for Transit operations, a commitment to the second leg of Rapid Transit, and money to replace old Transit buses. See the full operating budget for more information. The Executive Policy Committee voted on the budget December 13, and Council on December 17. After a letter to Winnipeg Transit to better understand their priority seating policy, we invited a representative from Transit to our meeting to discuss a variety of issues. Check the November 2013 meeting minutes for more details. We hope to continue this positive relationship with Winnipeg Transit. At our September 2013 meeting we voted on priority issues to take action on. We agreed that “Priority Seating” was something affecting a number of association members and will be learning more about the current policy in the next month.